Pergo XP Rustic Grey Oak Laminate Flooring has a beautifully detailed putty colored base that is highlighted with Smokey grey tones giving it a sophisticated look. The authentic texture of Rustic Grey Oak showcases the high character that will complement any home interior. Designed from reclaimed wagon planks, the beauty of this Pergo flooring is highlighted with the 6-1/8 in. wide single plank format and accented by the 4-sided milled bevel edge. Pergo XP Rustic Grey Oak with PermaMax Surface Protection provides double the wear, double the durability of ordinary laminates. XP products are AC4 rated, approved for general commercial traffic; suitable for your home, office or other light commercial applications such as boutiques and hotel rooms. This rating was designated after being tested for resistance to abrasion, impact, staining and cigarette burns. ScratchGuard Advanced provides superior scratch and scuff protection. The patented click joint makes installation quick and easy, providing a secure fit. Each plank is 10 mm thick with an additional 2 mm of attached underlayment. The limited lifetime residential warranty and 5-year limited light commercial warranty guarantees the top layer against wear through, staining or fading. Wear claim compared to standard AC3 laminate flooring and measured in accordance with NALFA/ANSI LF-01-2011 and/or EN13329:2006+A1:2008. California residents: see Proposition 65 Information. 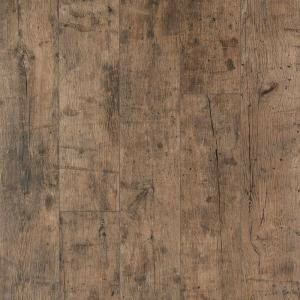 Buy online Pergo XP Rustic Grey Oak 10 mm Thick x 6-1/8 in. Wide x 54-11/32 in. Length Laminate Flooring (20.86 sq. ft. / case) LF000821, leave review and share Your friends.